It's time...time to get over my fear of blog posting. With the support of so many wonderful people in my life, I've finally transitioned from an "armchair designer" to seeing my sewing pattern "PiNS" in local Maritime fabric stores. Along with this transition comes knowledge-seeking in all things Social Media. Wow! That's a doozy, for sure! What a journey these last few months have been! I'd love to hear from anyone else who has struggled with the Monster that is Social Media. It's exciting and daunting all at once. They have installed a revolving door at the library just for me as I check out book after book with all things related to this Monster. Yes...I still love the printed page but am starting to embrace an online presence as well. And now for a shameless plug...Our wonderful little guild, The Maritime Modern Quilt Guild, will have a display of all things modern and quilted at the Fibre Arts Festival in Amherst, Nova Scotia from October 13-17th. Come on out and check us out. We'd love to see you! And now...I'm off to explore all things bloggy...widgets, buttons and what-nots, before I take to the friendly skies, this afternoon. Happy Thanksgiving everyone!! I am so grateful for my amazing family and friends! And while my dishwasher decided to stop working this weekend, I am decidedly grateful that I am fortunate enough to have one in my kitchen. Yeah Karen!! You took the leap. Good luck with your Pins pattern. Be afraid no more! 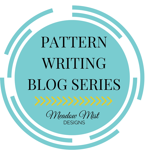 You are now a blogging pattern maker!